The Fluke Calibration 8508A Reference Multimeter provides reference standard accuracy and stability, in a functionally versatile, easy-to-use solution. This 8.5 digit meter is designed to address the measurement challenges faced by metrologists, yet is remarkably easy to use. The 8508A/01 model includes front and rear input binding posts, which make it invaluable for making ratio measurements, which are available on both voltage and resistance functions. When making i.e. resistance ratio measurements, the same excitation current flows through the resistors connected to both the front and rear binding posts. This technique, along with True-Ohms current reversal, ensures measurement errors are minimized. This makes the 8508A/01 a true metrologists reference DMM. 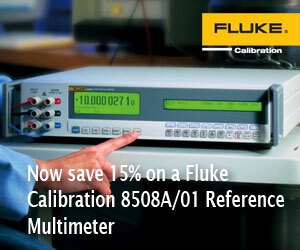 You will now receive a 15% discount on the 8508A/01 Reference Multimeter.